The Ender's Game movie release date is November 1st, 2013. That's only 10 days away. Director Gavin Hood's Ender's Game is an adaptation of the classic 1985 novel, by Orson Scott Card, of the same name. The movie tells the story of Andrew "Ender" Wiggin, played by Asa Butterfield, who goes to Battle School to take military training for the war against an alien assault. The Ender's Game movie cast includes veteran actors like Harrison Ford and Ben Kingsley. In the near future, a hostile alien race (called the Formics) have attacked Earth. If not for the legendary heroics of International Fleet Commander, Mazer Rackham (Ben Kingsley), all would have been lost. In preparation for the next attack, the highly esteemed Colonel Graff (Harrison Ford) and the International Military are training only the best young children to find the future Mazer. Ender Wiggin (Asa Butterfield), a shy, but strategically brilliant boy is pulled out of his school to join the elite.Arriving at Battle School, Ender quickly and easily masters increasingly difficult war games, distinguishing himself and winning respect amongst his peers. Ender is soon ordained by Graff as the military's next great hope, resulting in his promotion to Command School. Once there, he's trained by Mazer Rackham, himself, to lead his fellow soldiers into an epic battle that will determine the future of Earth and save the human race. 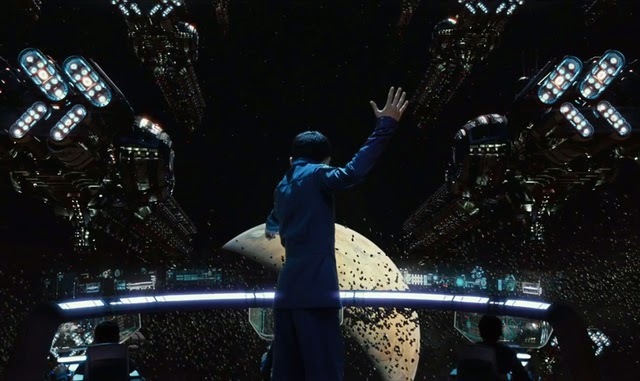 Ender's Game will hit theaters on November 1, 2013. What do you think of the trailer? If you've read the book, does it seem faithful to the novel? Do you plan to read the novel? Looking forward to the movie. As I said, I liked the book, but didn't love it. I might watch this except the author is such a piece of crap that I'd hate for him to make any money off me. fingers crossed... i am riding the fence. sorry i have been "off-world" the last several weeks.... life is! I have a friend that named her little boy Ender. We'll see it, I'm sure. I think all the "controversy" is totally ridiculous. I'm hoping it's her last one David, because that would be phenomenal. I hope the movie is more interesting than the book. I mean most of it, he was training. The trailer looked good though when I went to see Gravity last week. Maybe it will be good. Shrug. I honestly didn't think of it that way. I'll have to ask her.